A 13-day hiking and educational tour. 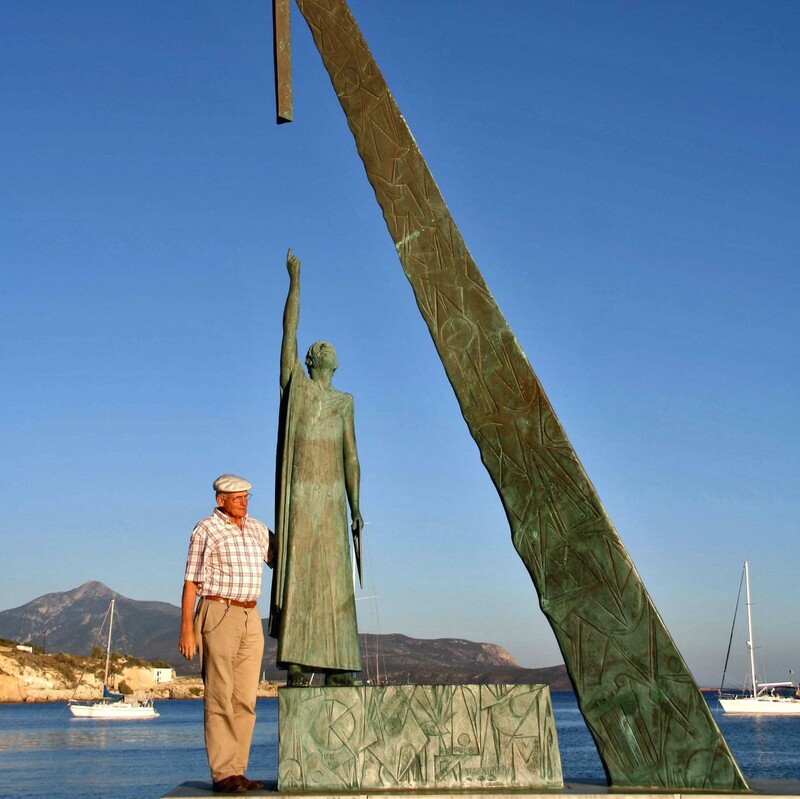 SAMOS: the island of Pythagoras and centre of Hera's cult; her sanctuary, the Heraion of Samos, is in the UNESCO World Heritage List. 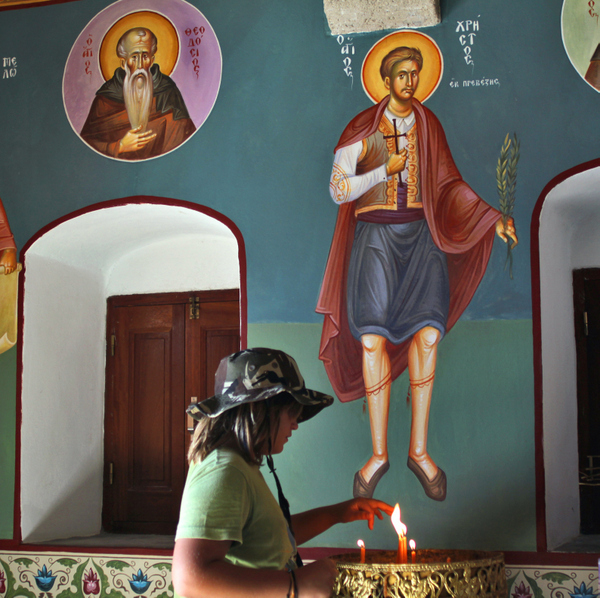 In PATMOS one can visit the cave where St. John had the vision of the Apocalypse. The monastery of St. John the "Theologian" with the Cave of the Apocalypse is an important Christian pilgrimage and also an UNESCO World Heritage Site. 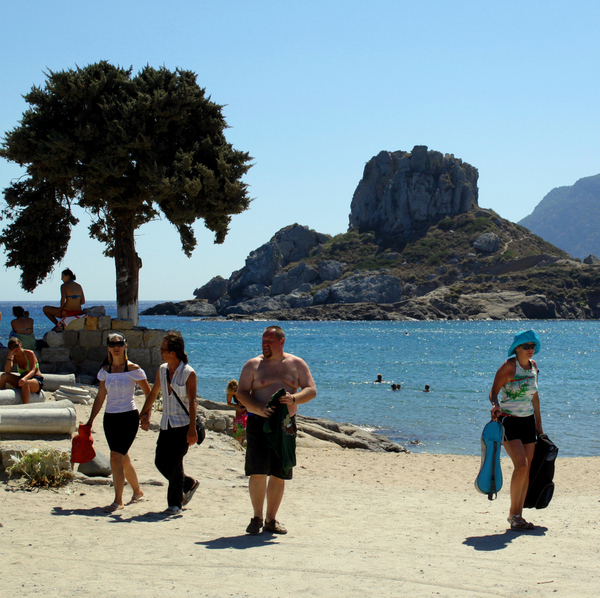 KOS was an important centre of the cult of Asclepius, the healing god, and birthplace of Hippocrates, the legendary "father of medicine"; today also a popular destination for beach enthusiasts. On NISYROS sleeps an active volcano. 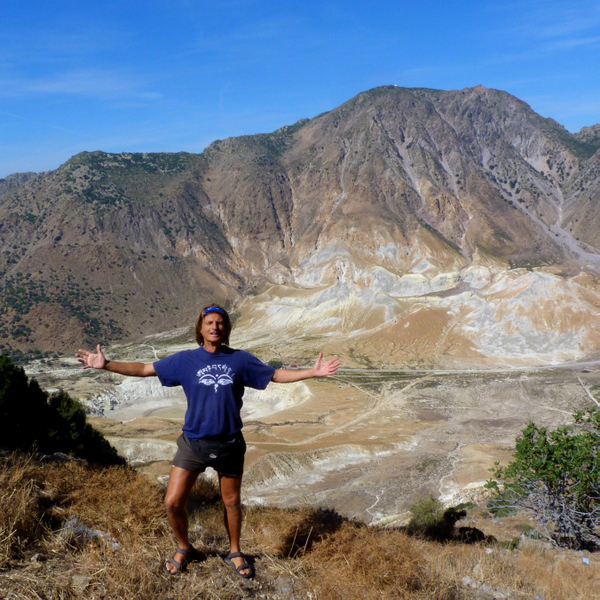 A 13-day educational tour with opportunity of several easy hikes. 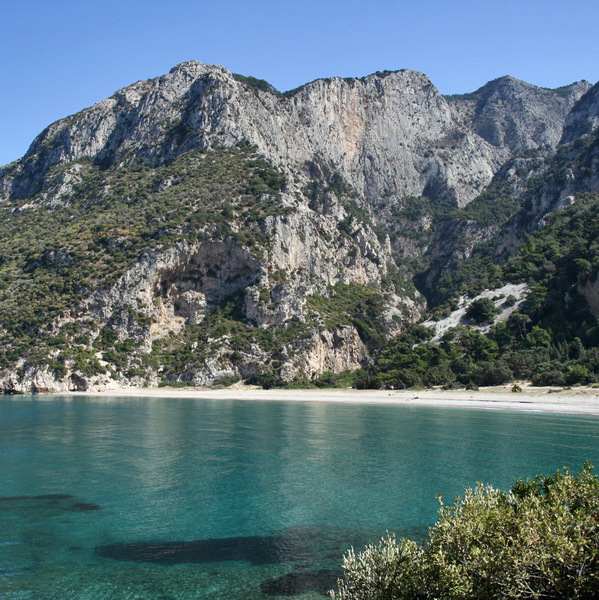 Mountainous, green and rich in wines Samos is the island of Pythagoras, the centre of Hera's (Zeus' wife) cult, homeland of the astronomer Aristarchus and birthplace of the philosopher Epicurus. In order to create the spectacular tunnel-aqueduct of the antique capital, two working groups under the lead of the engineer Eupalinos dug from both ends in a methodical manner. In his ballad "The Ring of Polycrates" Schiller sung the connected on hubris uncanny luck of the tyrant. The Heraion of Samos and the Eupalinian aqueduct belong to the World Heritage List of UNESCO. 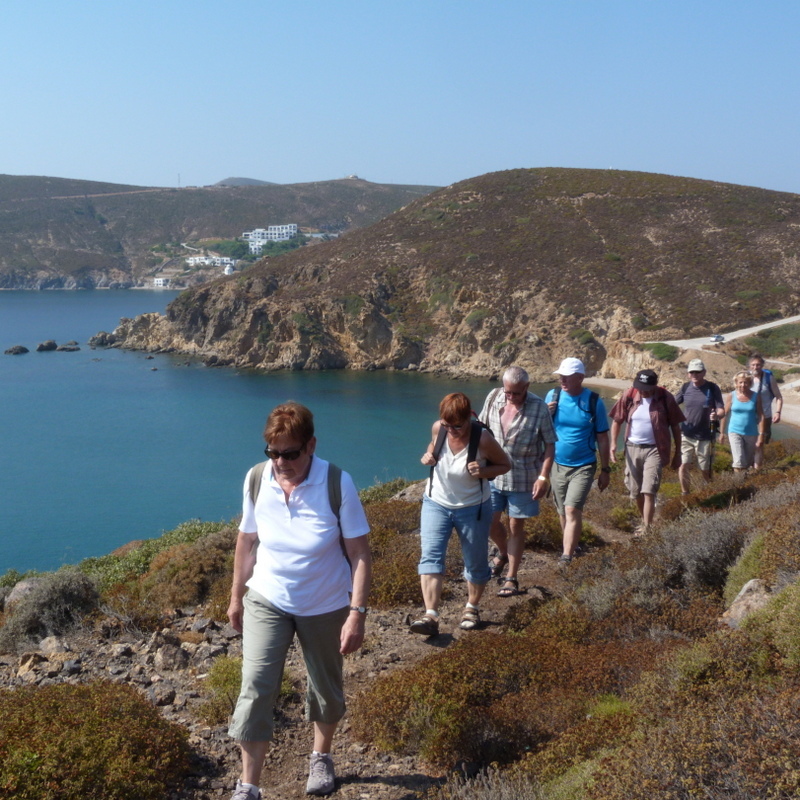 Small, hilly and barren Patmos: An island for hermits. 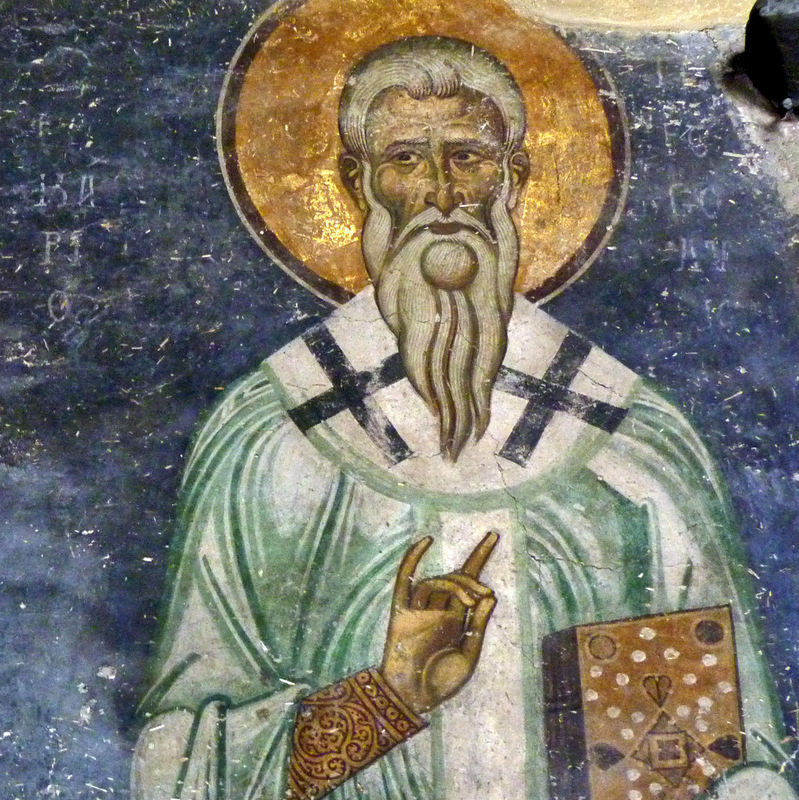 This small island of the Dodecanese is reputed to be where, in a cave, St. John the Theologian had the vision of the Revelation and dictated it at his disciple Prochorus who was present. The monastery of St. John, an important Christian pilgrimage place, stands proud on the medieval castle hill over the traditional settlement of the Chora, the old capital of the island. The entire complex is in the UNESCO World Heritage List. Vast beaches surround the fertile island of Kos, birthplace of Hippocrates, a former centre Asclepius' cult, nowadays a popular destination for beach enthusiasts. On the square in front of St. John’s citadel is still shown the ancient Plane Tree, where Hippocrates is alleged to have taught. The Asclepieion (the temple of Asclepius) of Kos was among the most significant of its period and, for archaeologists, it represents one of the most typical Hellenistic assets. Day 1 - Welcome. 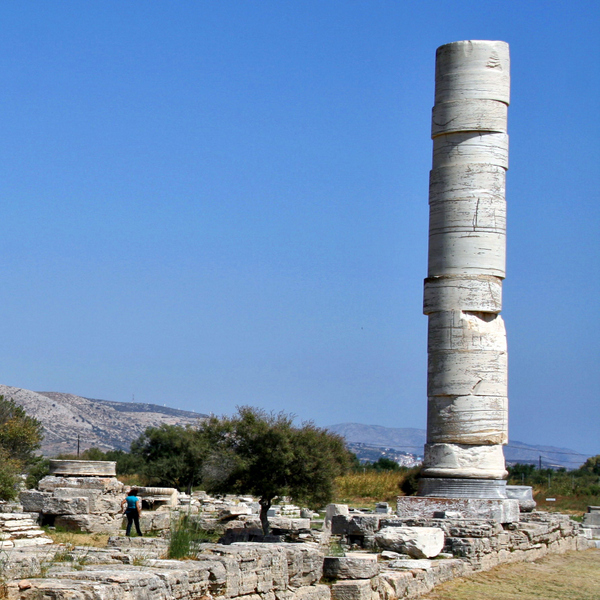 Traces of antiquity: Samos, a thriving city-state, cultural, economic and religious center of Ionia. Day 2 - The sanctuary of Samian Hera. The tunnels of Eupalinos. Vathy: The capital of the island. An archaic colossus in the museum. Hiking to the Straits of Mycale. We visit the Heraion of Samos, one of the most important pilgrimage sites of antiquity and the Eupalinos’ subterranean aqueduct, one of the masterpieces of ancient engineering. 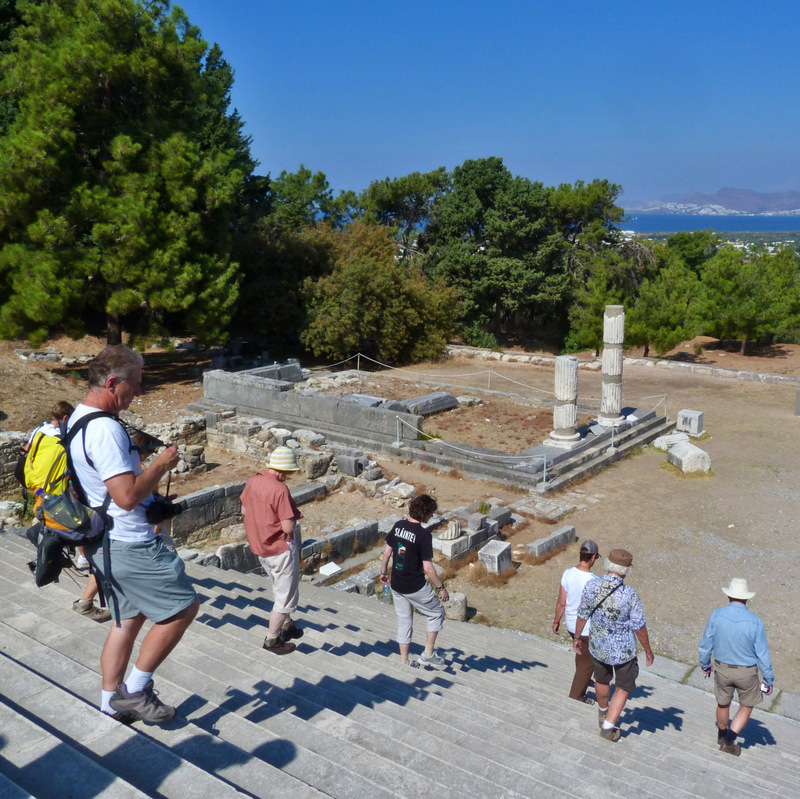 Bus ride to Vathy, the amphitheatrically built capital of Samos, with its neoclassical buildings. 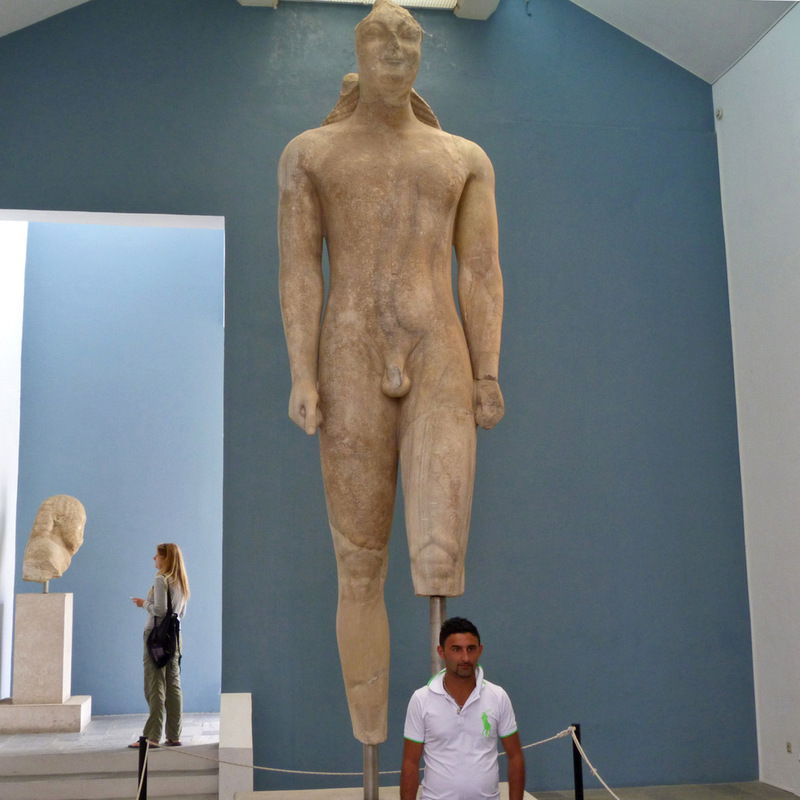 We stroll through the traditional settlement and visit the Archaeological Museum, where the priceless finds from Hera’s sanctuary are exhibited: The new museum wing was specially built to receive the archaic sculptures and particularly to accommodate the colossal young man. Hiking opportunity to Psili Ammos on the Straits of Mycale, the narrowest point between a Greek island and Turkey, about 1.5 km. Day 3 - Magnificent hike on Kerkis mountain. The town of Karlovasi. By bus, via the inland we pass to the extreme west of the island. 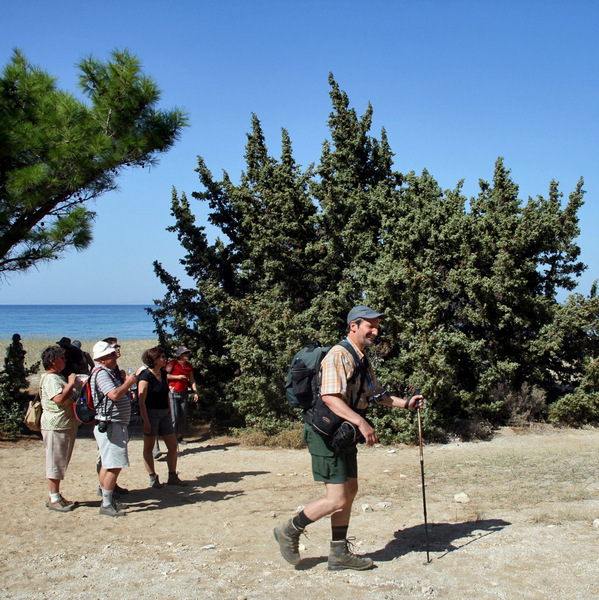 We hike along the northern slopes of the Mount Kerkis, from the mountainous village Drakaioi to Seitani beach. Swimming opportunity. Stroll through Karlovasi, where well maintained neoclassical houses and the old industrial buildings witness the economic blossom of the past. Return to the hotel on the north coast. Day 4 - Hiking through scenic landscapes, via old pathways and picturesque villages. Bus ride to the village of Agios Konstantinos, on the northern coast. 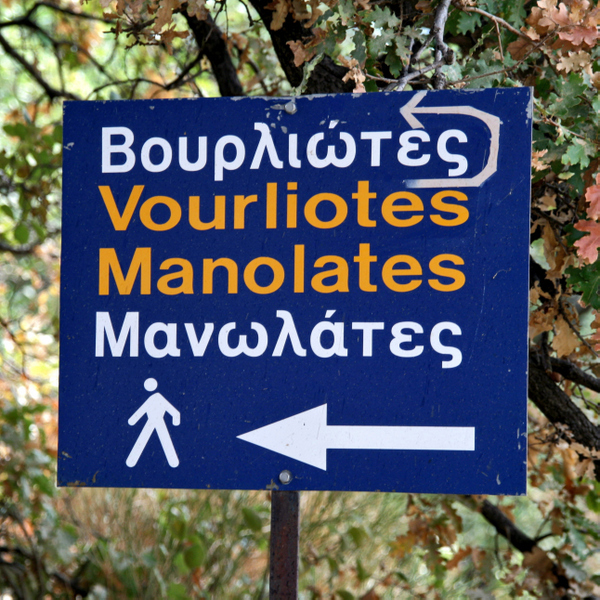 We hike through the "Nightingale Valley", passing by Manolates, Vourliotes and Kokkari, back to the hotel. Day 5 - Farewell Samos, crossing to Patmos. Morning at leisure. Early in the afternoon we catch the ferry to Patmos (3.5 hours). 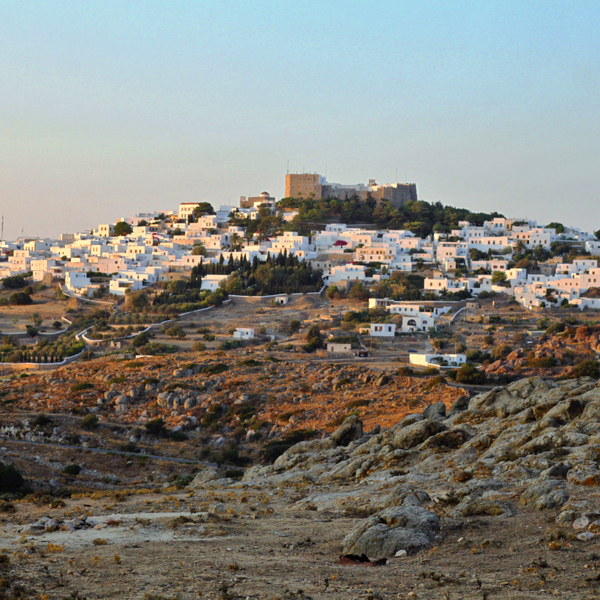 3 nights in Patmos. Day 6 - In the shadow of the Apocalypse. 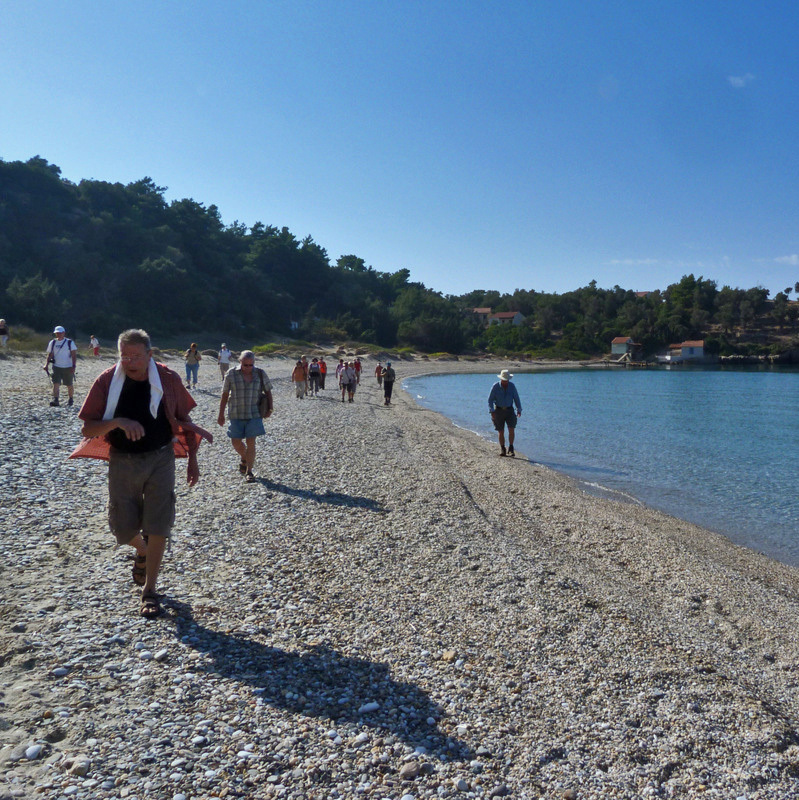 Hiking from Skala to the Cave of Revelation, an important pilgrimage site for Christians, and the Monastery of St. John. Stroll through the Chora, the picturesque old capital of the island, developed over the centuries around the fortified monastery. The ensemble belongs to the World Heritage List of UNESCO. Hiking opportunity to Grikos a swimming area. The island is an ideal destination for both the adventurous and passionate for swimming tourists, as well as for religious Christian pilgrims, and this will be particularly obvious during this trip. Day 7 - Hiking in beautiful island landscapes. 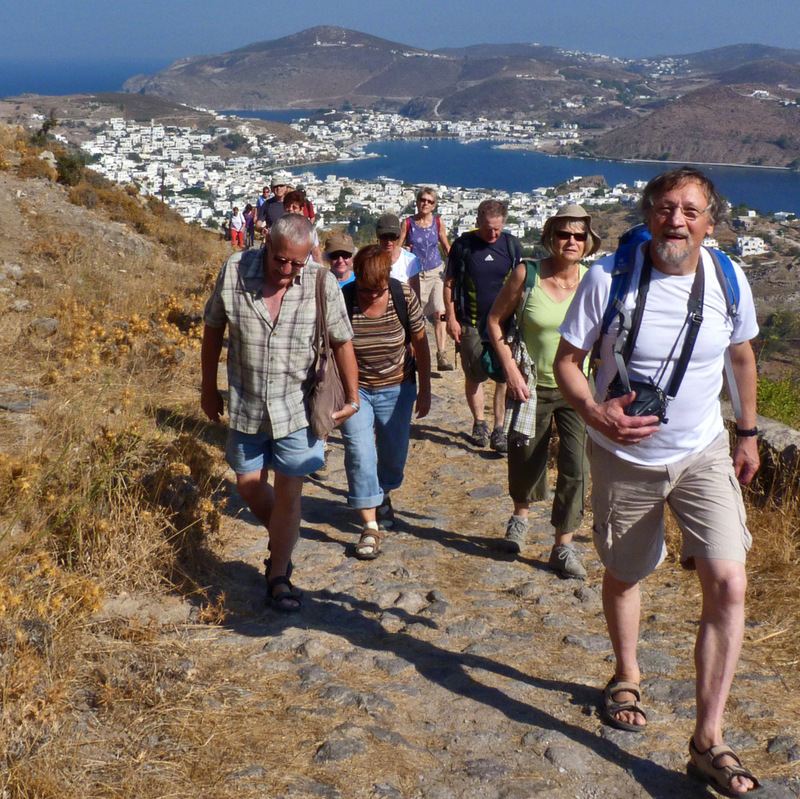 Further touring on the island of Patmos with hiking and swimming opportunities. 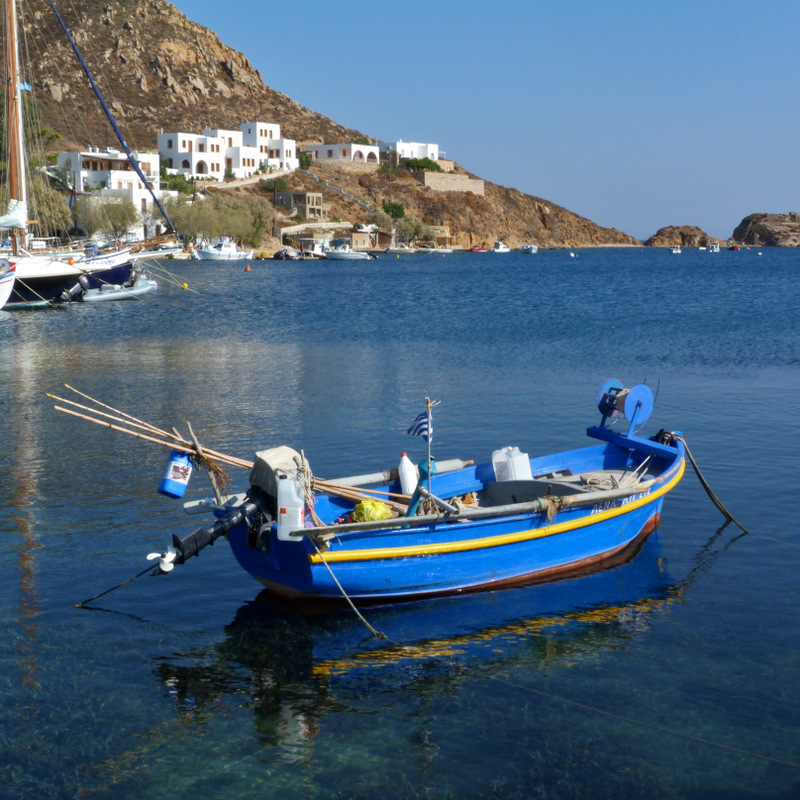 Patmos is known due to its many small but also larger bays, several of which are only accessible on foot. There is almost no spot without a friendly, whitewashed chapel. Remember: we are on a pilgrimage island! We hike along the beach: first to Campos-bay and next to “Livadi tou Pothitou”. Swimming opportunity. Day 8 - Remains of the ancient world. Hiking opportunities to the NE. 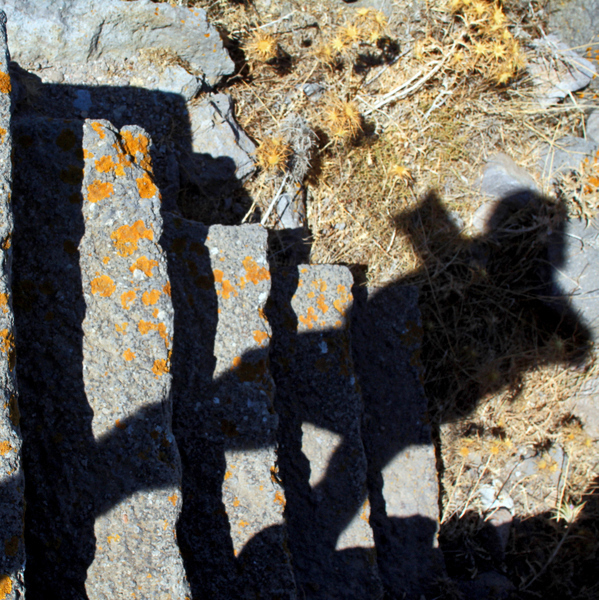 Hiking on the scenic castle-hill Kasteli, where remains of the ancient acropolis are still visible. 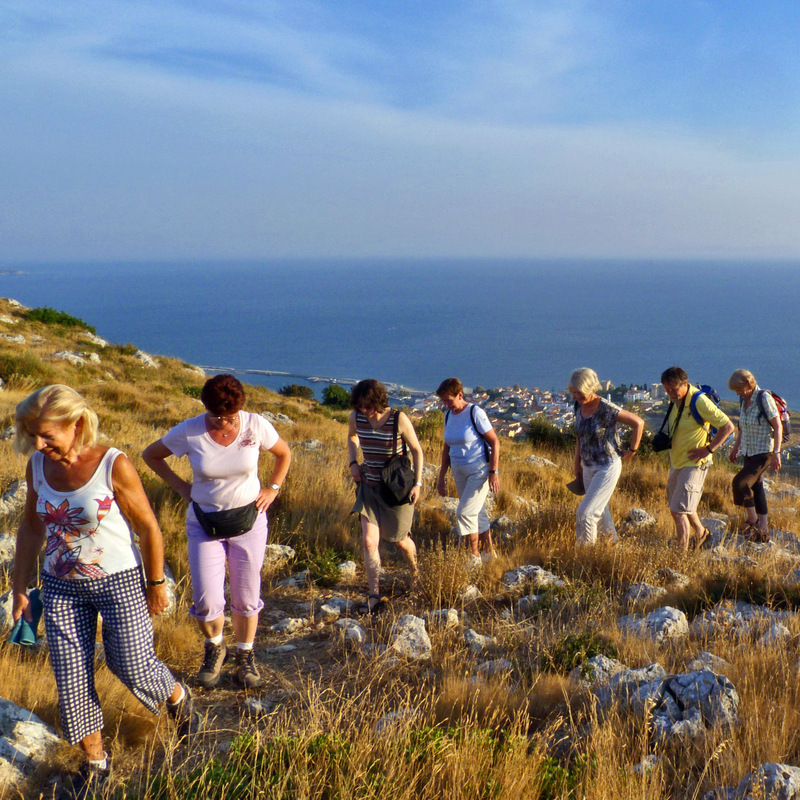 In the afternoon we will have the opportunity of a round hike from the village of Campos to the bays of Lefkes and Agios Nikolaos. Day 9 - Farewell to Patmos, passage to Kos. The morning is at leisure. 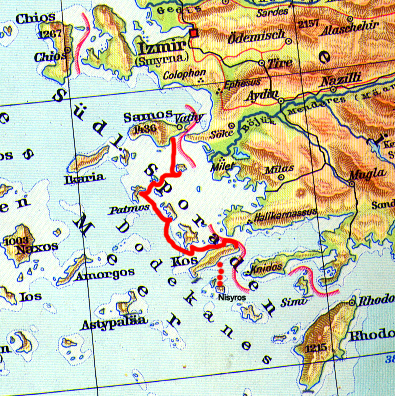 Around noon, we catch a boat to the island of Kos (approx. 4 hours). 4 nights in Kos. Day 10 - Castles, churches and deserted beaches. Island tour and hiking opportunities to the southwest of the island. Well preserved and almost in the center of the island, the castle of Antimachia, is famous for its medieval walls and churches. In the extreme southwest, not far from Kefalos, stand the imposing ruins of the palaeochristian church of Agios Stephanos. 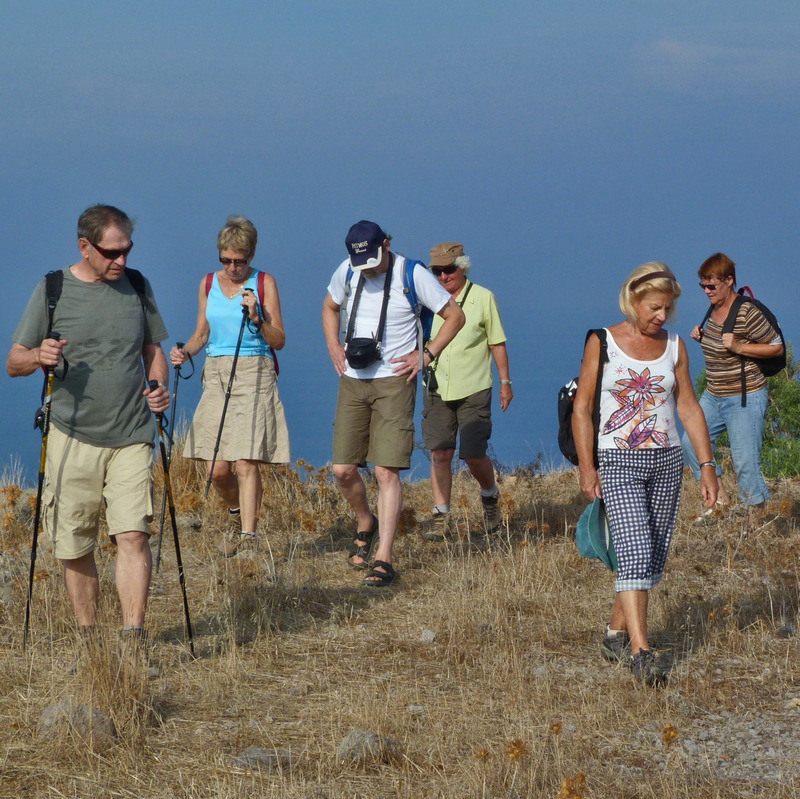 Hiking opportunity from the chapel of Prodromos, located on a scenic spot high on the hillside, to the Chapel of Theologos on the SW coast. 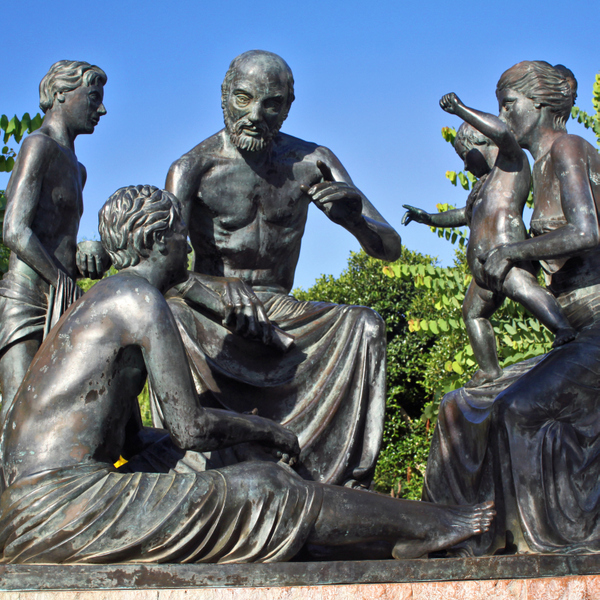 Day 11 - Healing gods and physicians in the ancient world: The Asclepieion and the Plane Tree of Hippocrates. Crusaders on Kos: The Knights Castle in the town of Kos. The fortress ruins of Pili. We visit the sanctuary of Asclepius, on a hill views to Asia Minor, not far from the capital of the island: It was one of the most important pilgrimage sites of antiquity. 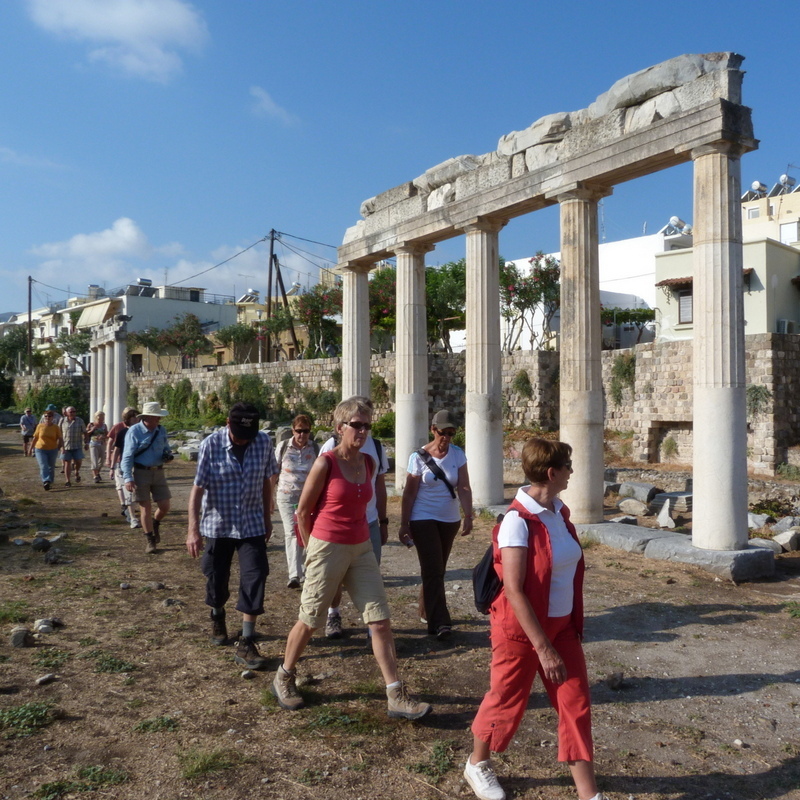 In the middle of the modern capital, remains of the ancient city, from the Greek and Roman antiquity, were excavated. 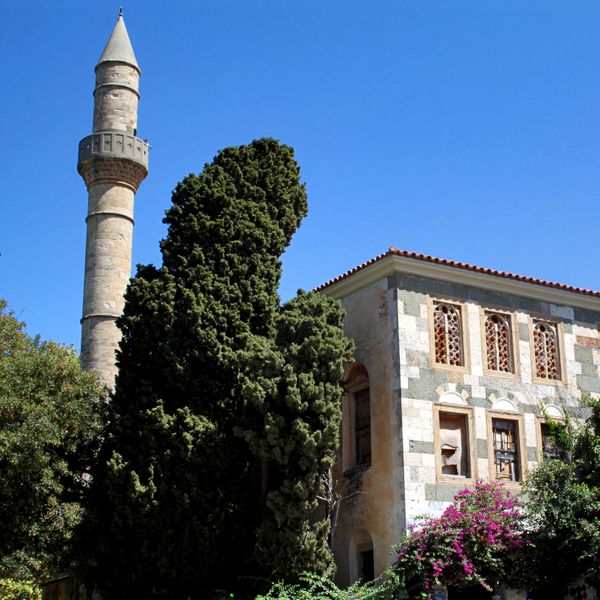 We stroll past buildings out of the Italian and the Ottoman period to the Knights’ citadel. 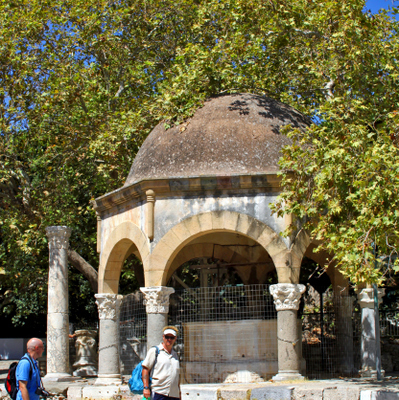 In the square in front of the castle stands the ancient Plane Tree where Hippocrates had taught in the 5th century BC. 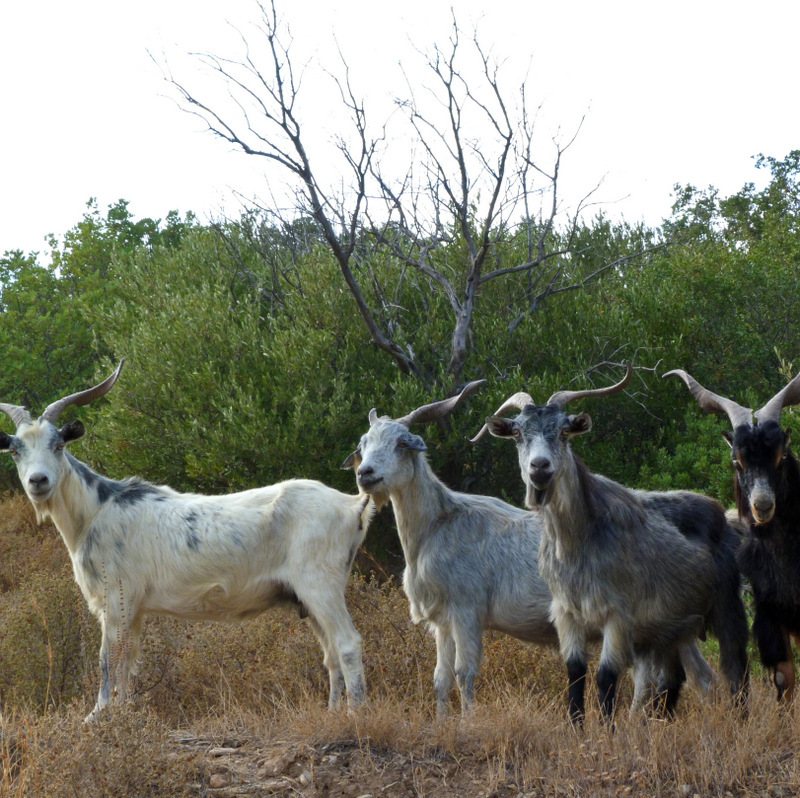 In the inland, on a hill at the foot of Dikeos-mountain, stands the deserted medieval settlement of Old Pili. 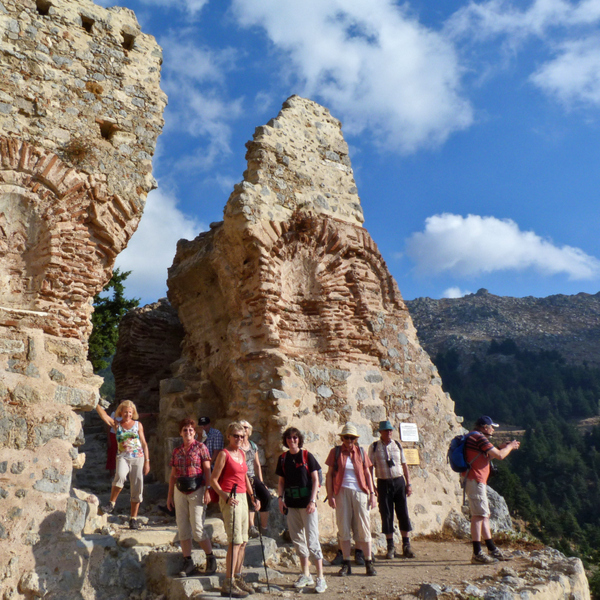 The castle ruins on the summit offer a splendid panoramic view to the north, while beautiful Byzantine frescoes one can see in the church of Panagia. Day 12 - Day excursion to Nisyros. Morning at leisure. In the afternoon transfer to the Airport and return home. Overnight stays in neat mid-range hotels, in a quiet area, just a few minutes walking from the center.